Commissioned by Max Factor himself to create his wife's signature orange-red lipstick shade, Ida Gál-Csiszar​ wasn't just any ol' makeup artist in Hollywood's heyday. In fact your current go-to lip color could very well have been formulated by Gál ​herself. Having served as a master chemist/consultant for major brands including Max Factor, Tom Ford, Smashbox, and many more for decades, the industry legend has finally struck out on her own with her new line ​Gállány, which is Hungarian for "girl." Crafting high shine yet balm-like lip glosses, luxe buildable mascara, crème satin lipsticks, and primer-infused eyeshadow quads, ​Gállány​ is on track to become as popular as her clientele, if not more. And to mark the launch of her line, ​​Gàl-Csiszar​​ has unearthed ten of her best kept Old Hollywood beauty secrets. Suffice it to say: your face will never be the same. 1. LET YOUR MASCARA DOUBLE AS A LIQUID LINERBack in the day, mascara wasn't created in a vial with a brush applicator, but in a dry cake format. "What was great about that application is that you could apply the cake with a brush to coat your lashes and then use a brush to create liner for your eyes," explains Gàl-Csiszar​​. "But when Maybelline first created the liquid base formula in a vial with a brush, the duality of the old school formulation became obsolete as the newer formulation flaked when you tried to use it as a liner." 2. USE YOUR BLUSH AS A LIPSTICK BASE OR LINERThis is a trick Gàl-Csiszar​​ picked up from Robert Salvatore, Max Factor's lead makeup artist, back in the day. By slightly dampening a lip brush, then dipping it in a blush to use as a "base" and to "outline" the lips before applying lipstick, the blush serves as an anchor for the lipstick—enabling it to stay all day. "It's still the best old school trick of the trade," she explains, having created the cheek duos launching in January with that purpose in mind. 3. USE LIPSTICK AS A CREAM CHEEK BLUSH OR BRONZERGàl-Csiszar​​ insists everyone can do this and that any lip color works—but there's a trick to the perfect application. "After you apply your lipstick press your lips together, then with the index and middle finger from your dominate hand, press the center of your lower lips and tap lightly to pick up color," she says. "Next, press your fingers together and sweep the color across your cheeks." To further sculpt your cheeks, you can also layer a powder blush on top. Luxe is the most versatile color from the collection, but Gàl-Csiszar​​ says warmer lip tones like Nutmeg can double as a bronzer. For bolder colors, like a true red, blend, blend, and then blend some more. 4. 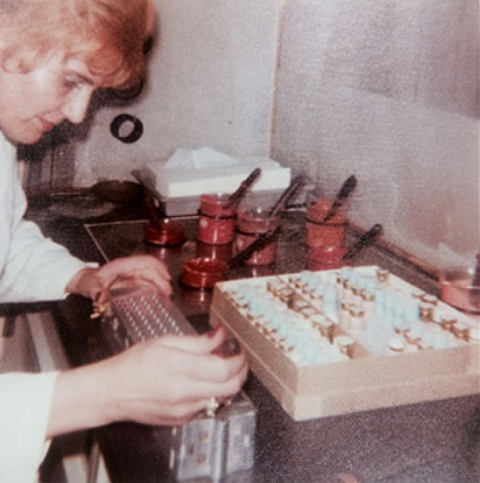 LIFT YOUR FACE WITH GLOSSGàl-Csiszar​​ was one of the first cosmetic chemists to develop lip gloss in the late '70s. (Before lip gloss, Vaseline was used for everything.) "Use a clean disposable mascara wand, dip it into your lip gloss, and brush it through the high points of your brow upward and outward to lift the eye and give the illusion of higher cheekbones. The light reflection will make your eyes sparkle as well." Try Gállány Lucite Lips ($18). 5. USE A FAUX BEAUTY MARK TO TRICK THE EYEThere's a reason many actresses—most famously Marilyn Monroe, of course—relied heavily on beauty marks. "Back in the day we didn't have all of the fillers and injectables that we have now and asymmetry was a major concern of starlets," she explains. "A well placed beauty mark can trick the eye to even out asymmetry or draw attention to a favorite feature." To experiment, Gàl-Csiszar​​ suggests trying a beauty mark high on the cheek using a sharp eyeliner or a water resistant mascara mascara to make a tiny dot, then to press the liquid with your fingertip before it dries so that it looks more natural." 6. USE A MATTE ORANGE SHADOW TO MAKE YOUR EYES POP"Matte sunset and amber orange tones were important shades during the early '40s and all the way through the late '70s," explains Gàl-Csiszar​​. The beauty of a warm matte tone is that it enhances EVERY eye color, accenting gold flecks in the iris, acting as a complementary contracts to blues and greens, as well as warming up brown eyes. It was one of Salvatore's go-to colors and she created the Cognac shade in the Brownstone Quad ($30) in his honor. 7. APPLY SHADOW AND EYELINER WITH YOUR EYES OPENAnother tip she picked up from Salvatore, you must put your makeup where you want it to go with the face in the position that it will be seen in. "It makes me crazy when I see these girls in tutorials closing their eyes and tugging at the corners to get their liner on," says Gàl-Csiszar​​. "They spend all of this time perfecting a line or a crease that disappears or folds when the eye is open." Bottom line: Keep your eyes open, get a great vanity mirror, and know your face. 8. CARRY A HIGHLIGHTER AT *ALL* TIMESGàl-Csiszar​​ believes the best way to freshen up the face and give of the impression of vitality/youth is with strobing AKA highlighting. 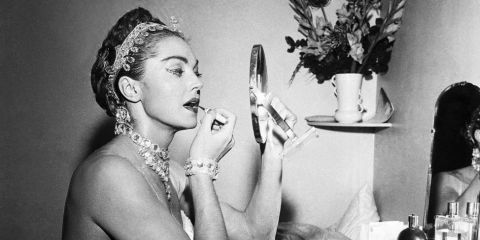 Her and her peers would always make sure the silver screen actresses had little, lipstick-like tubes for touch-ups. 9. DEFINE THE ROOTS OF THE LASH LINE WITH A FAN BRUSHThere's nothing like a thicket of lush lashes to open the eyes, but it requires precision *and* a fan brush. "Lining the upper inner membrane of the lash line helps to define the eyes and makes lashes look fuller, but you must pay attention to the root of the lash," explains Gàl-Csiszar​​. "If you don't get in there, you will see the naked skin between the lashes and it ruins everything." 10. CHANGE YOUR FACE SHAPE BY SHADING YOUR HAIRLINE Even though this is a trick we recently picked up from the Kardashians, it's not exactly new. "Hairlines were a big deal in the day and could radically change a celebrity's overall appeal or their look for a role," she says. "Deepening the scalp under your hairline or at your part can make a true impact, especially when going from day to night." To do so, Gàl-Csiszar​​ recommends using a stiff shadow brush to stipple an eyeshadow two shades lighter than your hair into the hairline, going as far as two inches deep for blondes. Then, lightly coat the baby hair at the hairline with a tinted brow gel and check from every angle to be sure that nothing is obvious. Again, blend, blend, and blend. Have you heard about our velvet textured shadows with rich pigments? Check out our limited edition NYC collection at gallanycosmetics.com!